Following the late arrival of spring here in Central Maine — and hopefully the last few weeks of frosts — we were able to put in a new bed of asparagus crowns for our Research trials. Many of you have likely already received your crowns and planted them, but for those still waiting on the weather to break, now’s a great time to prepare the bed. Here’s a walk-through, with some tips for success. to keep the plants healthy for many years to come. If you chose a location that is less than ideal, there are workarounds to improve the site, but in the long run it will be more work. Choose a location that receives full sun or part shade. As you can see in the pictures, our asparagus trial is out in the open, with little shade from nearby trees. It is best to check your soil pH the fall before you plant; you’ll be able to apply any amendments at that time so it can reach the ideal pH of 7.0 for spring. Proper bed preparation in the spring is key — it is much easier to rid the area of weeds before you have planted than to fight weeds throughout the life of the asparagus bed. After you ensure that your planting location is weed free, dig a furrow 5–8” deep. If your soil is heavy, a shallow furrow is better, to prevent the crowns from becoming waterlogged. 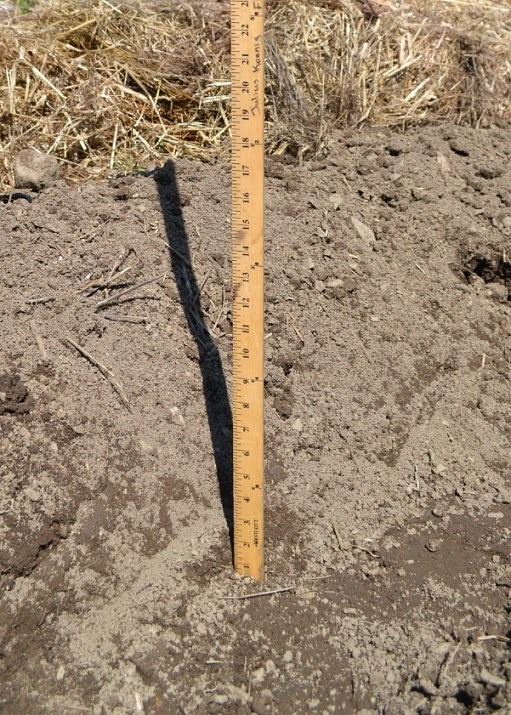 We have well-drained soil at our Research farm, and you can see here that our furrow is about 8” deep. The crowns will look dry when you pull them out of the box, but that is completely normal. Because we had our crowns before we were ready to plant, we opened the box and removed the band from the bundle of crowns to inspect them. Mold that sometimes forms during shipping is easily wiped off with a damp cloth, and shouldn't affect the health of the crowns. If they appear to have dried out during shipping, sprinkle the crowns with a bit of water. After inspecting the crowns, we placed them loosely in the box, then loosely closed the box and placed it in a standard refrigerator. We checked on them every few days to ensure they remained healthy until we were ready to plant. When the timing is right — 3–4 weeks before the last average frost — and your furrow is dug, it’s time to plant. Our planting date this year was May 4th. Place the crowns 12” apart in the furrow. If you’re planting Purple Passion (F1), the in-row spacing should be slightly closer, 6–8” apart, to avoid overly thick spears. Splay the roots out as best you can while keeping the crowns upright time to plant. Although the furrow is deep, at this time you will only cover the crowns with 2–3” of soil. Water the crowns until the soil is damp, and keep them moderately moist throughout the establishment period. Now you wait — it can take a couple to a few weeks for the crowns to become established and start growing. As spears appear, you will gradually fill in the furrow as they grow — check back in a couple of weeks to see images of how our new asparagus bed is growing! Labels: Garden tech, Maine, Maine farms, Tech Tip, What's new at the farm?